Attorney Eve A. Bouchard is a proud graduate of the University of Florida, Levin College of Law. 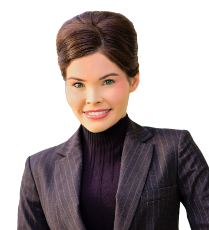 She is a published co-author of Politics-Proof Asset Protection and Estate Planning – Shield Yourself from the Legal and Financial Chaos of 21st Century Politics. Her practice of law focuses primarily on estate planning, estate litigation, probate, guardianship, and trust administration. She is admitted to practice before the courts of the State of Florida, as well as the U.S. District Court for the Middle District of Florida. She has been practicing law for over eleven years. Attorney Bouchard serves as an Attorney Advisor for Lawyers Advising Lawyers, a Division of The Florida Bar, providing legal advice to other Florida Bar attorneys of in the areas of probate law, trust law and estate planning. She is a Board Member of Brevard County Association of Women Lawyers. Attorney Bouchard is also a proud member of Real Property, Probate and Trust Law Section of the Florida Bar, which is dedicated to serving the citizens of the State of Florida. Additionally, she is a member of Brevard County Bar Association and Florida Association of Woman Lawyers. Attorney Bouchard serves as a Board Member of Children Advocacy Center of Brevard, which is a non-for-profit organization dedicated to helping children in need. Additionally, she actively supports Brevard Schools Foundation (and has served as former Chairman and former Co-Chairman of Brevard Schools Foundation Supply Zone Committee). She has served as a member of the National Network of Estate Planning Attorneys and the Orange County Bar Association, providing pro-bono guardianship representation and services to individuals in need. In addition to practicing law full-time, Attorney Bouchard has served as a college professor, teaching in the fields of law in which she practices and as President of Medical Advisory Group. Attorney Bouchard was born and raised in Orlando, Florida and is married to Frank G. Ditz, M.D., a concierge physician with Family Practice of Suntree and Viera, P.A. in Suntree, Florida. As a National Merit Scholar, she earned her Bachelor’s Degree, graduating one year early with the highest honors. While working her way through law school, she was certified by the Florida Supreme Court to practice law as a legal intern and she served as a judicial clerk in Alachua County. She was involved in numerous activities, including service as a Legal/Medical Journal Researcher, an Appellate Advocacy and Legal Writing Professor’s Assistant. She received the Book Award in Legal Drafting and Honors in Legal Writing and Appellate Advocacy. She again graduated early with honors. Attorney Bouchard is dedicated to excellence and personal service to clients.